Karl and I are closeted hermits. We may appear to be extroverted on the outside, but underneath it all, we just want to be indoors, in jammies, indulging in a slice of pie. So when a three-day weekend rolls, curious folks are disappointed by our reclusive plans. “You’re young – you need to go out more! !”, they may say. “I’m old, and I’m cold. I need to be in bed by ten.”, I’d respond. 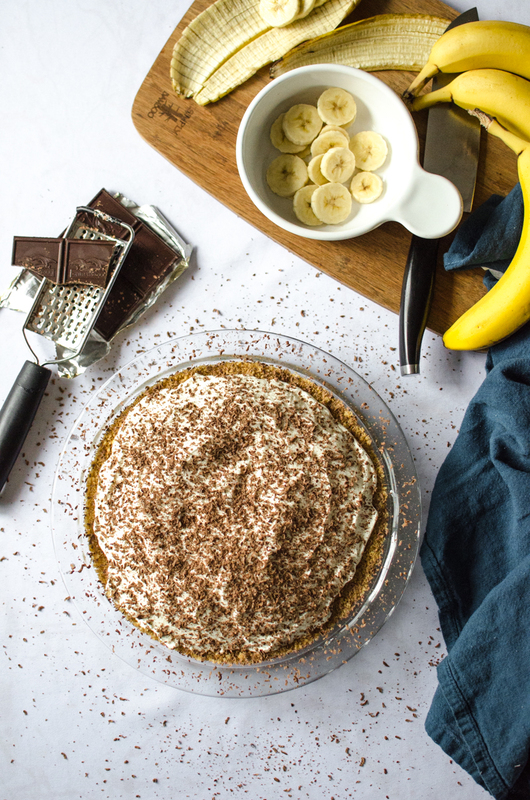 We just love being cozy at home, especially because home is where all the ingredients for banoffee pie are. And home is where the oven preheats to a perfect 350 degrees. 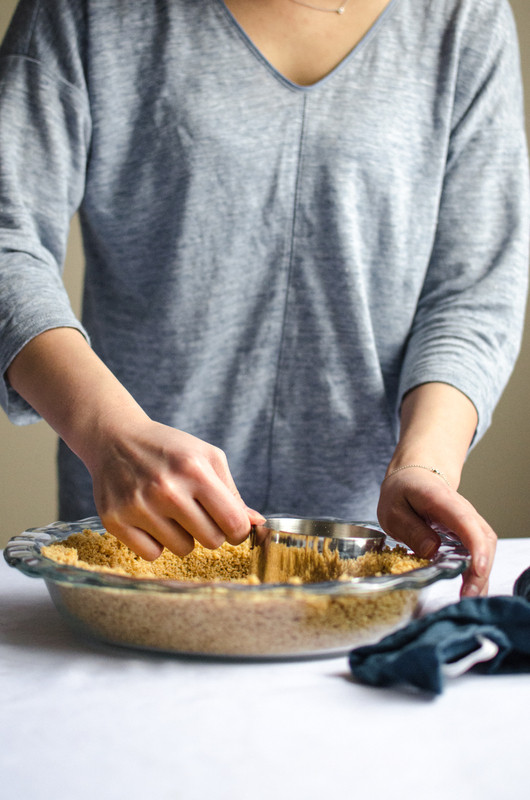 Home is where the air fills with the smell of a sweet graham cracker crust. Leaving home under these conditions is a painful struggle. 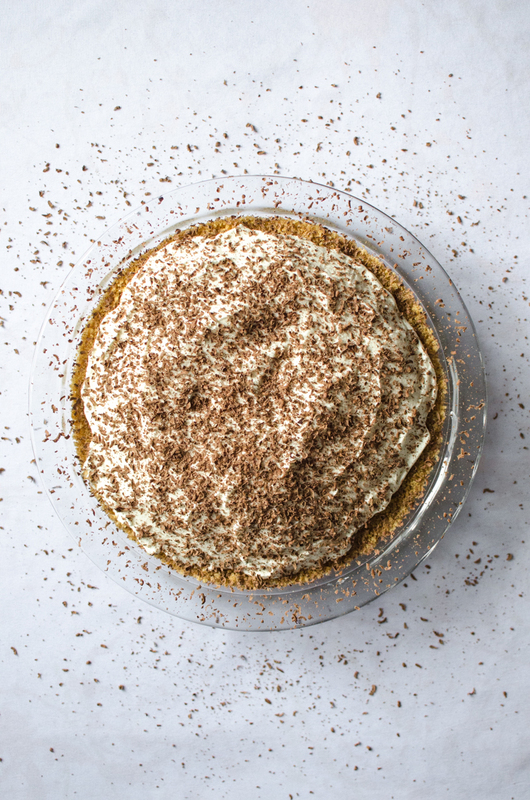 In case you haven’t picked up on it yet, I have a fervent love for banoffee pie. It’s rich, decadent, and the perfect treat for my insatiable sweet tooth. Karl’s sweet tooth is also a huge fan. 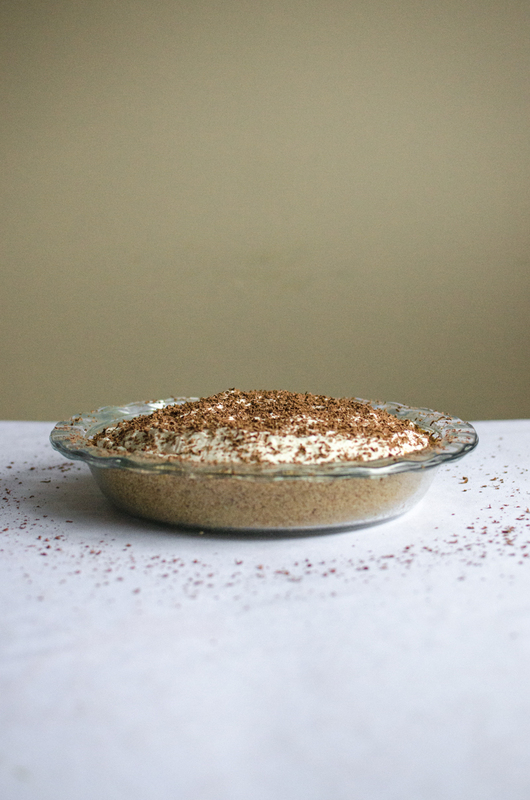 The graham cracker crust is gently toasted in the oven. The pie is filled with a sweet, sticky toffee!! But wait, it gets better. Down goes a layer of sliced bananas, then the whole thing is covered in fluffy whipped cream and chocolate bits. 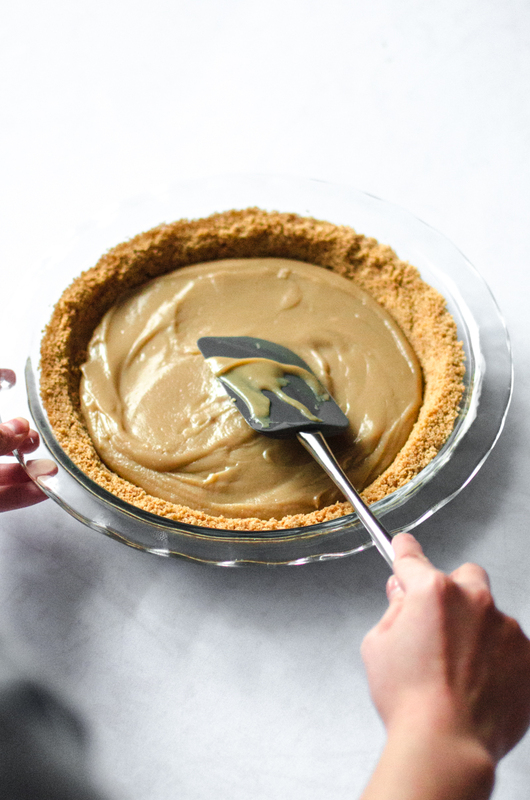 This awesome recipe is adapted from Saveur’s classic banoffee pie recipe, and I have to thank Sally for her graham cracker crust! 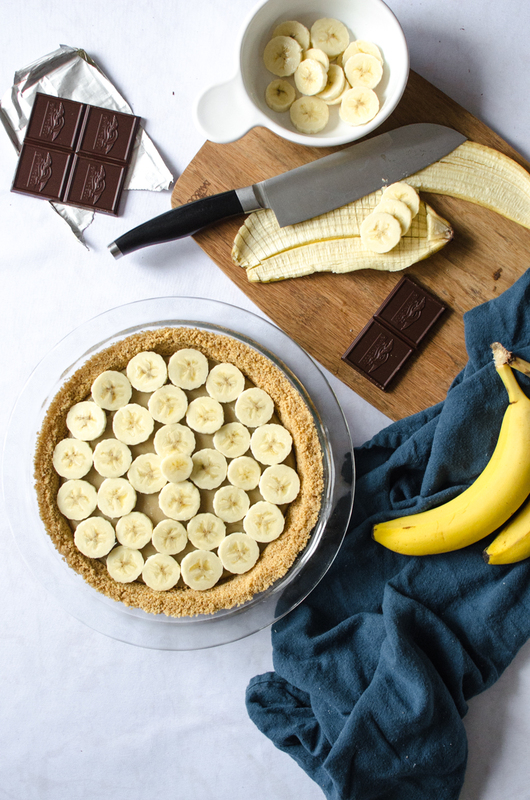 Finally, my new blogfriend, Helen, over at Well-Being Secrets has put together an awesome article about the health benefits of bananas – in case you need another reason to have banoffee pie. 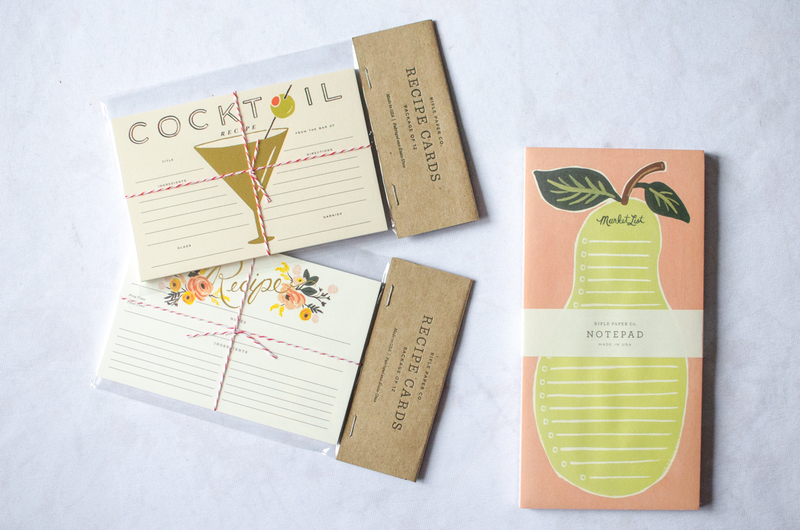 Special thanks to Rifle Paper Co. for sending over these gorgeous recipe cards! I cannot wait to fill my recipe box with them. 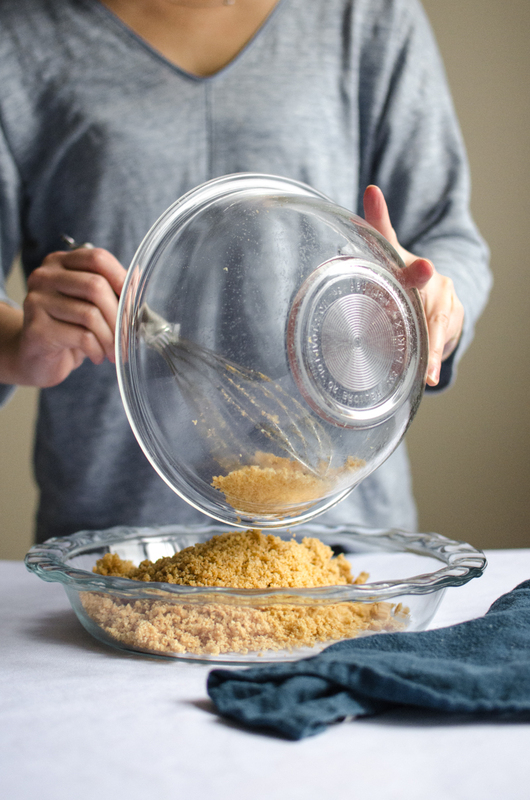 Preheat the oven to 350 degrees F. In a food processor, combine the graham crackers and sugar. Pulse until the graham crackers are fine crumbs. Pour in the crumbs into a medium mixing bowl, stir in the butter and whisk until incorporated. 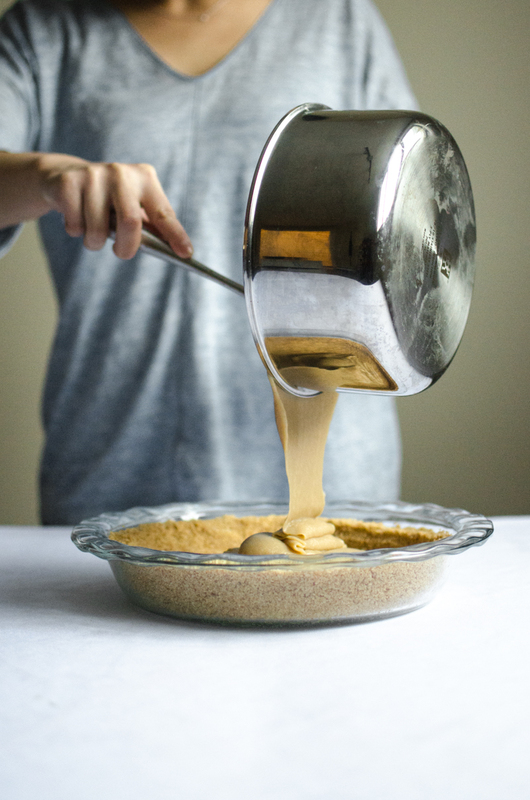 Pour the mixture into a 9½ inch pie dish. 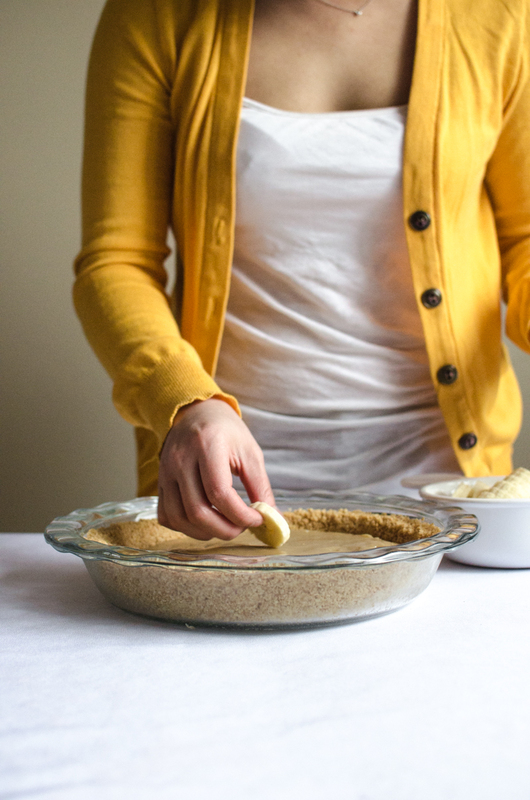 Use a flat measuring cup to press the mixture into the pie dish. Make sure it's packed tightly. Bake for 7 minutes. Cool at room-temperature for 30 minutes, then cool in the fridge for another 40 minutes. In a 2-quart saucepan, melt the butter over medium-heat. Add the brown sugar and whisk until dissolved. Whisk in the sweetened condensed milk, then boil for 2-3 minutes, whisking continuously. Pour the filling into the chilled pie dish. Cover and cool in the fridge for at least one hour. 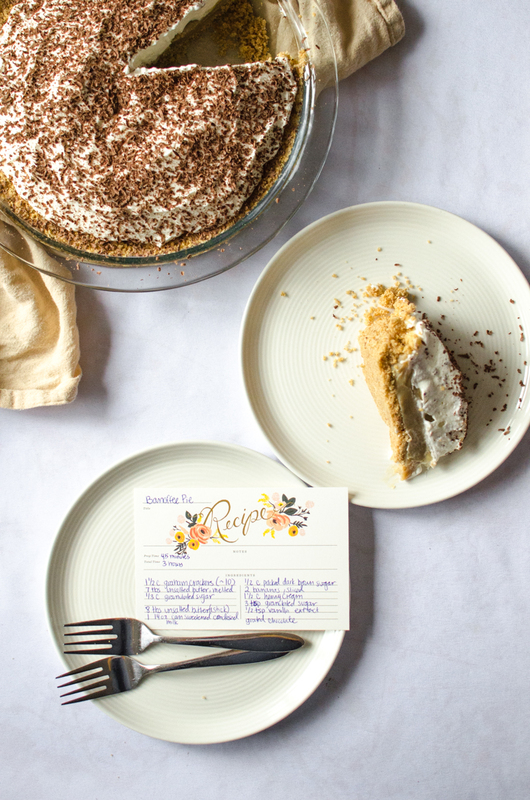 Take the pie out of the fridge. Place the banana slices in a single layer on top of the toffee filling. Combine the heavy cream, sugar, and vanilla extract in a large mixing bowl. With an electric mixer, whip the cream on high-speed until the cream reaches stiff peaks, about 2-3 minutes. 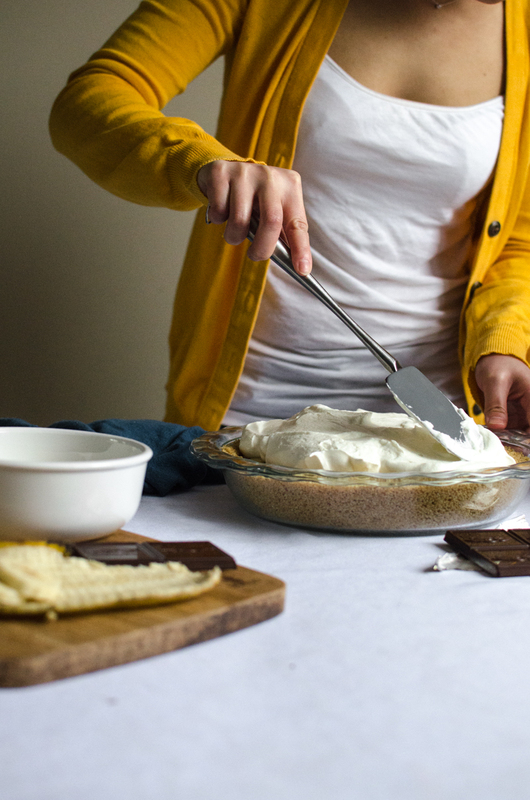 Spread the whipped cream over the pie. 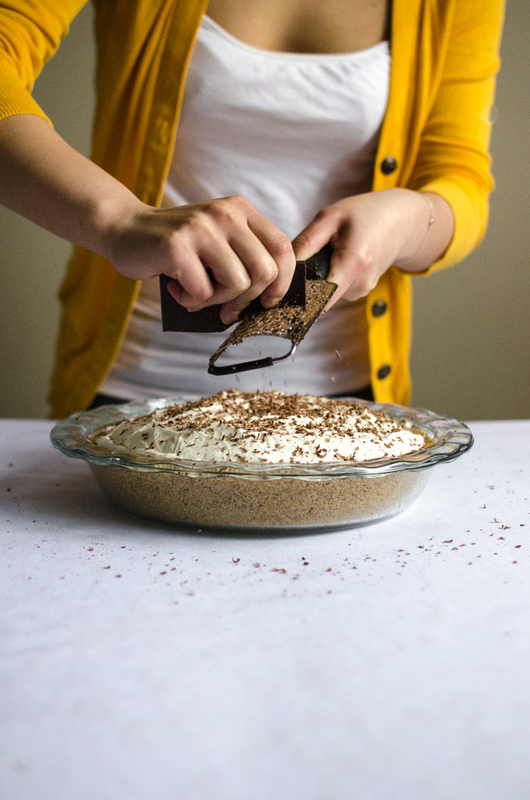 Sprinkle the grated chocolate over the pie, then serve. Keep the pie chilled when not serving. 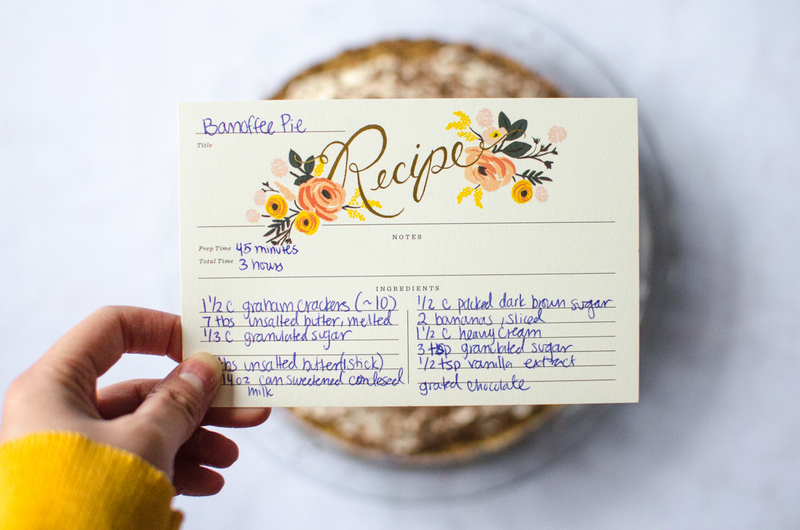 This entry was posted in Desserts & Sweets and tagged bananas, brown sugar, chocolate, graham crackers, heavy cream, pie, Rifle Paper Co., sweetened condensed milk, toffee. I tried this exact same recipe and can never get the toffee to the right texture…sometimes i undercook it and it never sets in the fridge and oozes out once we make the first slice. 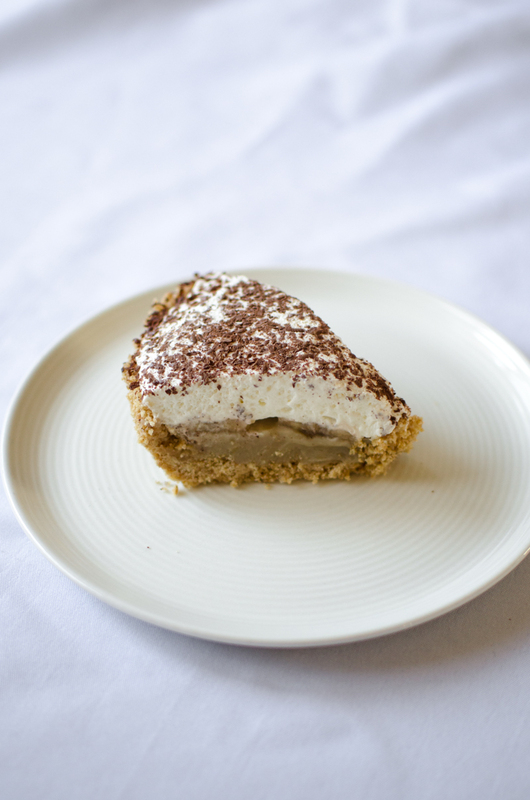 When I try cooking it longer, it ends up too chewy like candy, not a good texture for banoffee pie, ends up sticking on everything. Any tips on that? Would love to know any specific temperature i can cook it too, to be more accurate…. I much prefer this method that cooking a can of condensed milk for hours, just seems too risky. Thanks so much for reaching out (: Cooking toffee can be super tricky, and there definitely is a sweet spot for temperature and cooking time. In general, simmering the toffee for 2-3 minutes over medium heat should allow it to set in the fridge. As you already know, toffee can overcook really quickly, resulting in that chewy, candy-like toffee you describe! I am going to make this again soon and take notes on temperature – will report back soon! I followed your directions and it came out perfect! The toffe was amazing. I made it again for my mom for mother’s day and since she loves chocolate I added a layer of chocolate mousse and it was even better. She loved it!